Ios is one of those unexpected gems of the Aegean sea. Known for its vibrant night life, particularly during the height of the summer season, the island in fact attracts a wide range of people from all over the World. Here visitors will find some of the best beaches in Europe in some of the most scenic of island landscapes, Byzantine churches everywhere, outstanding restaurants providing the best traditional Greek dishes, and the most important prehistoric archaeological site in the Cyclades. There are a number of archaeological and historical sites that alone make Ios an essential stop for anyone exploring the archaeology of this part of the Mediterranean. The prehistoric settlement of Skarkos is a must. 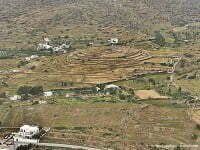 Not only was the site awarded an award of excellence in 2008 by the European Union, Skarkos is in fact the best archaeological site in the region of this period. Remains of the Cycladic settlement dating back some 4,500 years were discovered relatively recently as important archaeological sites go. Consequently, more advanced excavation has led to some spectacular discoveries and greatly enhanced our understanding of prehistoric Cycladic culture. The site is only open between June and September, but the archaeology museum in Chora is open all year round and displays a full range of the artefacts that have been recovered from Skarkos. A number of inscribed marble stones have been found that together with other archaeological finds from the more recent Hellenistic periods provide quite a detailed account of what island life was like at these times. These stones are now on display in the Archaeological Museum of Ios. But from this period of the past, the island is better known as the final resting place of Homer - widely recognised a one of the greatest of the ancient Greek poets. 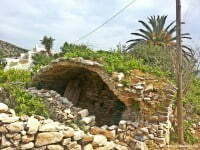 What is thought to be Homer's Tomb can be visited in the north of the island. Perhaps you will not be overwhelmed by the archaeology on Ios, but there is something here from all the major periods of this regions history. But the various sites you can visit are in scenic parts of the island that only enhances any visit. For example, the 15th century Venetian fortifications at Paleokastro is as dramatic a setting as they come. After visiting that site, go down to the beach and small village of Psathi for lunch or a picnic. A modest museum founded in 1999, following the important and exciting discoveries at the nearby prehistoric site of Skarkos, is a great place to begin exploring the archaeology of Ios. A series of interesting displays provide a background to the prehistory of the island, in particular a fascinating array of artefacts from Skarkos. A set of inscribed stones from the Hellenic period provide textual evidence for what life was like on the island at this time. Homer is one of the most revered of the ancient Greek poets. He is the author of the two epics, the 'Iliad' and the 'Odyssey', that are widely thought to represent the beginning of Western Literature as we know it. But, the details of his life are not well known, including where he was buried. The ancient Greek historian Herodotus tells us he was died on the island of Ios. Tradition has it that in one of three graves on a small hill on the northern edge of the island is Homer's final resting place. 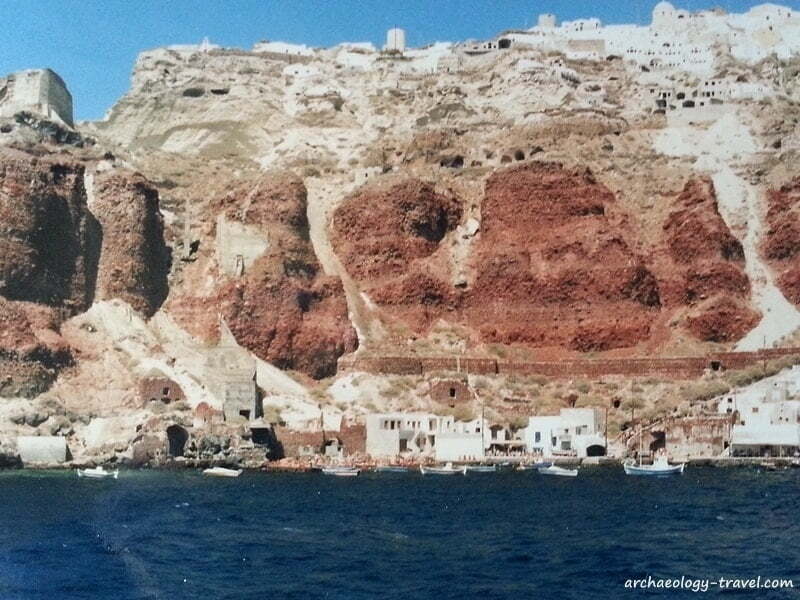 The old town of Chora lies to the north of the road leading up into the island from the port. 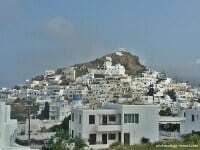 Traditional Cycladic buildings on narrow alleys appear to cling to the southern face of the hill. At the base, along the western and northern edges you can see the foundations of the walls once built to protect the town from pirates and the like. In amongst the Medieval houses that now house some fine restaurants are a wonderful collection of many Byzantine churches. 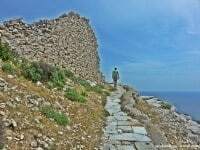 High on a hill that drops sharply in to the sea you can visit the remains of a 15th century fortification, more commonly called a castle (kastro, paleo - old), built by the Venetians. Although very ruined, from the standing walls it was clearly a substantial fort. In amongst the standing and ruinous Venetian walls, is an impressive later Byzantine church, that has dramatic views over the sea to neighbouring islands, highlighting the importance of this vantage point. Ios, along with many other Cycladic islands did not play much of a role in the Roman Empire. Consequently, physical evidence of the presence of Romans on the islands is very meagre, and there is not much to visit. On the eastern side of the island are the remains of what has long since been known as the 'Roman aqueduct'. All that has survived of this supposedly Roman structure is a single, complete arch. But there was clearly a similar arch on either side of the surviving arch. One of the striking features of the hillsides on Ios are the dry stone walls, built by farmers to retain the earth and prevent topsoil from being eroded way. 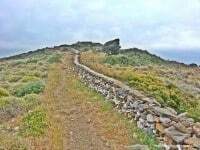 On a small hill just outside of Chora, beneath a series of concentric dry stone walls that run around the hill, archaeologists are currently excavating what is thought to be the best preserved Cycladic prehistoric site in Greece. The site is open to the public during the summer, from June to September. For more information about visiting the island of Ios, including practical such practical details as how to get there, where to stay, etc., click here. The port of Santorini in the volcanic caldera. Ios is not far from Santorini, which has the must see archaeology site of Akrotiri - the best known Minoan site outside of Crete. Given the island is in effect a sunken volcanic caldera, it is a very popular tourist destination, also attracting the cruise ships. It is possible to go from Ios to Santorini and back in a day. This is just what you need to see the spectacular island and the wonderful Minoan site and frescoes there, without the hassle of the tourist traps. How to Get to Ios? 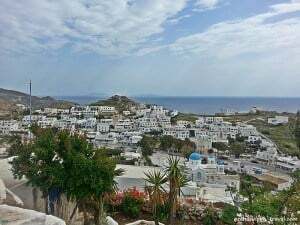 Ios is one of the Cyclades group of islands in the central Aegean Sea, about 107 nautical miles from Piraeus. The island is well connected by ferry routes - with daily sailings throughout the year to Piraeus. Depending on the time of year, there are regular ferry services to other islands, including Mykonos, Santorini, Naxos and Crete. Click here for ferry timetables and tickets to Ios. Alternatively, it is possible to fly to Mykonos and get a ferry to Ios. Bus Terminus at the port. Once on the island, there are the usual options for getting about. 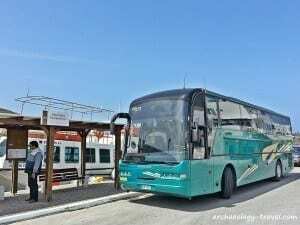 There is a good public bus service that runs from the port to Chora and Mylopotas Beach. These run quite frequently most of the time, but they are much more frequent during the peak holiday season. Taxis are also available. Or, if you prefer to be more independent, there are mopeds, ATVs and cars for hire, at various place in Chora and the port. Mopeds and ATVs are a popular way to get around the island and these can be hired by the day and longer. Having your own transport is essential if you want to visit some of the more remote sights and beaches. Otherwise the port, Chora and Mylopotas Beach are within easy walking distance of each other. The newer part of Chora. Ios has a good range of accommodation to suite all travelling styles and budgets, from a hostel (in the old part of Chora) to a handful of luxury boutique hotels. A few hotel can be found in the port, but there is a good range of hotels in the newer area of Chora - with wonderful views onto the old town of Chora. There are many more hotels, and a camping ground on Mylopotas Beach - a popular area in Ios. Although there are hotels open throughout the year, during the winter months there are only a few. Most hotels open around May, until October or November. In April 2014, I stayed at the Avanti Hotel. It is situated in the newer part of Chora and has wonderful views over the town on to the old town. A great hotel, and one I have no hesitation in recommending - if this is what and where you are looking for. Have a look at the photographs on the website - and allow yourself to be seduced, it is that good! Where, oh where do I start? Although I was only in Ios for four days, I managed to sample a good number of restaurants. And there are still so many more. I am not one of these holiday makers who thinks that when you are in Greece you have to eat Greek food. So seeing a Thai or Mexican restaurant in Ios is nothing to scoff at. After all, I am sure the Ionians like other cuisines when dining out at home just as much as I do. That said, I did stick to Greek restaurants. During my stay on Ios I ate with my travelling friends from Easy Hiker at a good range of restaurants. Our first and last meal was at The Nest, a highly rated restaurant that serves amazing traditional food at very reasonable prices. Owned and managed by two brothers, Georgios and Dimitris, much of the produce comes from their own garden (which I visited) and the dishes are cooked by their mother or at least using her recipes. Again we went for traditional Greek cuisine at the Enigma and The Mills restaurants, but never once did we have the same dish twice. For example, chick peas were served at each of these three restaurants, yet each dish was very different - and all equally good. For a typical Greek style grill - we enjoyed a mixed grill platter at the Peri Anemon in the port - an excellent place to stop for a meal or a snack while waiting for a ferry. 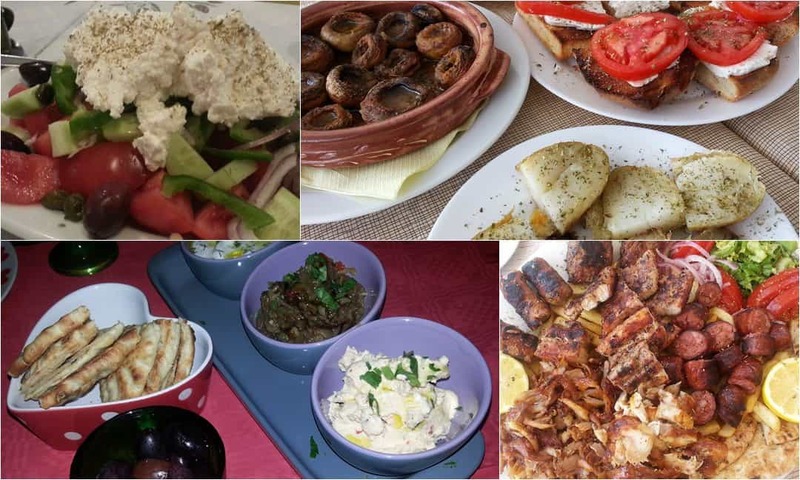 For interesting, contemporary twists on traditional Greek cuisine, I can recommend either or both the Lord Byron and Katogi restaurants - both of which have been featured in international food magazines. There are so many other restaurants in Chora and around the island. Not all were open in April, but a good many were. I am not saying these are necessarily the best restaurants, and avoid all the others. Rather, if you like good quality home-style food, cooked with care and sometimes added flare, you will not be disappointed with the restaurants mentioned here. One of the things I have been very impressed with during my recent visit to the Greek islands is the availability of free WiFi - that works! All of the hotels I have stayed in have had good WiFi for guests, and all but one restaurant had free WiFi. On Ios, there is also free public WiFi supplied by the municipality, that certainly worked well for me around Chora. Ios has many ATMs or cash dispensing bank machines. There is one on the ferry terminal building - for that much needed cash as you arrive or when you leave. Water is not safe to drink for the tap - so it is bottled water only. Having just spent five days on Ios, this is definitely an island I would return to - even if only for a holiday. Also, I would recommend it to people visiting the Greek islands who are specifically interested in the archaeology of the Cyclades. 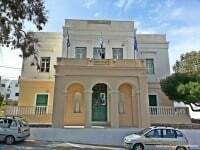 During my stay on Ios I was the guest of the island’s Municipality, and enjoyed the superb hospitality of many individuals, but should like to single out Michalis Petropoulos, the Mayor of the island, Angela Fakou, and Christos Varwnos.